Jacquelyn Jackson is a Southern girl at heart. Born and raised in Alabama, she attended Tuskegee University for her bachelor’s and master’s degrees. But then she was lured north by Iowa State University. Jackie was still an undergraduate at the time, and she quickly forgot all about the encounter until she completed her master’s degree and began to look for a school to attend for her doctorate. Jackie spent six years in Ames working toward her 2008 Ph.D. in plant genetics. She says that attending the same university as George Washington Carver, who became famous for his scientific research at Tuskegee, was unintentional, though she is well aware that she is following in his footsteps with her focus on genetically engineered sweet potato and peanut plants. Today Jackie is a research assistant professor in the Department of Agricultural and Environmental Sciences at Tuskegee University. Her current project involves cloning disease-resistant sweet potatoes in an effort to boost the root vegetable’s nutritional quality. One of her goals is to increase the amino acids to benefit third-world cultures that don’t have access to animal protein. 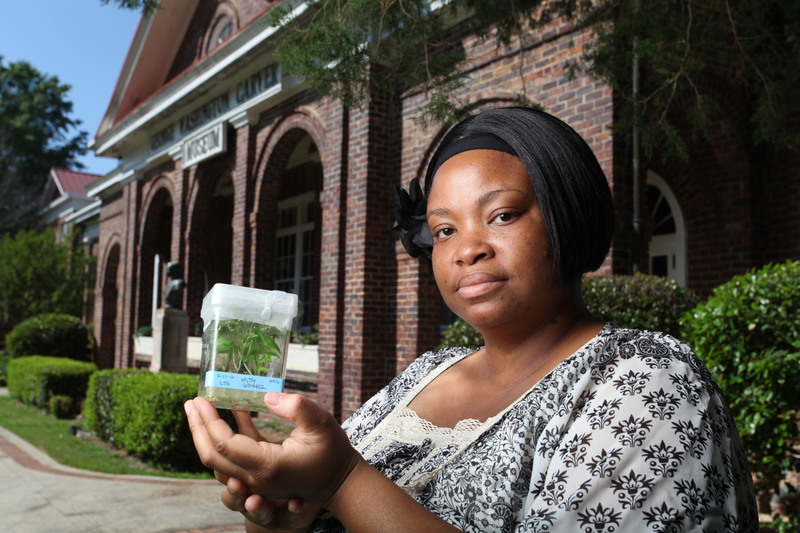 Photo note: Standing in front of the George Washington Carver Museum at Tuskegee University, Jackie holds a sweet potato plant growing in tissue culture, part of a breeding line called W154.